I’ve finished my latest painting! 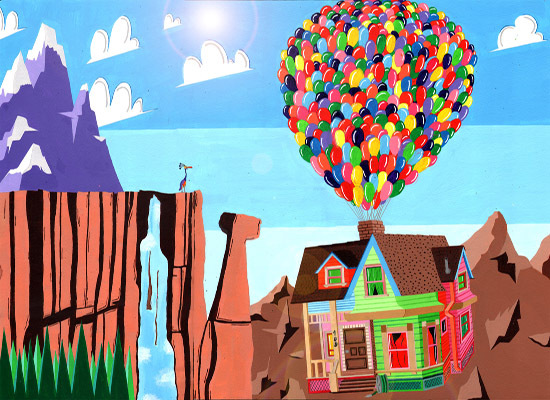 I decided to do a fun little homage piece to the Disney Pixar film, UP. I saw this film for the first time over the Christmas holidays and it was such a fun and heart warming story. One of things that struck me though was how colourful and vibrant the whole film was. From Carl’s house, to the balloons, to the exotic locations, everything about it was stunning. So I decided to paint this in appreciation of the film. I’ve had so much fun painting this, as I do with all my images. I have decided to call the painting ‘Up, up and away’. I’d love to know what you all think of it, so please do let me know, and share around if you like. Also let anyone else know you think might be a fan of the film. As always, you can buy the painting from www.degreeArt.com, and also purchase any prints directly from me, and who knows, if you’re lucky I might just do you a little deal! Read more about… Up, up and away!